Carl Whitewood at Strictly Yachts has sold his listing for sale, the 26.5 metre motor yacht Whisper IV, in an in-house deal. Built in GRP by Taiwan's Johnson Yachts to a design by Bill Dixon, she was delivered in 2005 as a Johnson 87' model and has been immaculately maintained since. Accommodation is for up to nine guests in a master suite, VIP suite and two twin cabins, all with en suite shower facilities. There are also berths for three crew. Her massive 23’ beam gives her the ability to offer convenient, safe, walk around decks, while containing a huge saloon and overall interior volumes unmatched by any yacht under 120 feet. The saloon on the main deck has large windows with an adjoining formal dining area. Forward is the galley with a separate dinette, wrap around windows and a U-shaped couch with table. Whisper IV is equipped with an ultra-modern stabilization system, which reduces roll motion effect and results in a smoother, more enjoyable cruising experience underway. 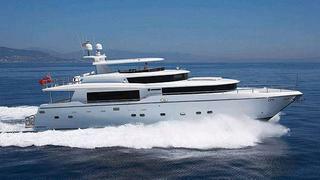 Twin 2,000hp MTU engines give her a cruising speed of 18 knots. Whisper IV was asking $1,866,000.